Understanding the significance of the Naha Stone requires understanding a bit of Hawaii’s history and the legendary lore of tradition and strength that accompanies it. 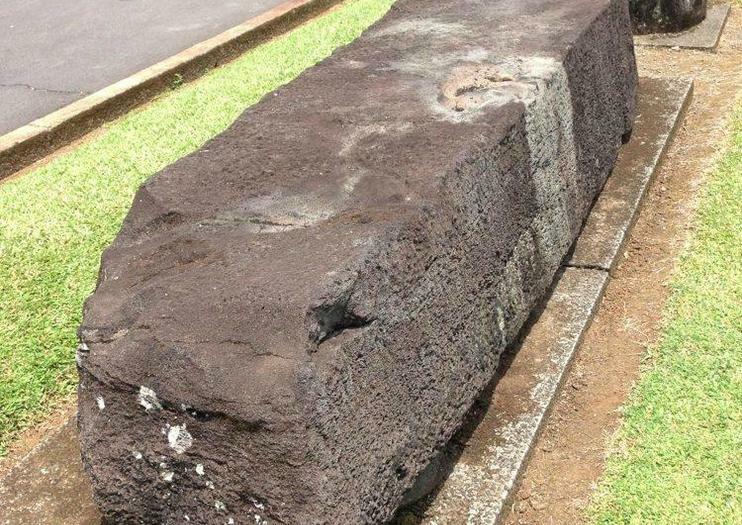 The Naha Stone is a rock that reportedly weighs between 2.5 and 3.5 tons and is believed to have been brought to Hilo from the island of Kauai using a double canoe. According to legend, in ancient times it was used by those of Naha descent in a test of royalty. When a baby boy was born, he was placed on the stone—if he stayed calm and quiet, he was Naha, and if he cried, he was not. It was also believed that whoever could move the rock would rule Hawaii. Legend says King Kamehameha I proved his strength at the age of just 14, when he overturned the Naha Stone. Following years of conflict, it was King Kamehameha I who united the Hawaiian Islands into one royal kingdom in 1810.